There are times when The Bubbly Black Girl Sheds Her Chameleon Skin seems to trying on multiple personalities for size, only so that it can quickly shed them. 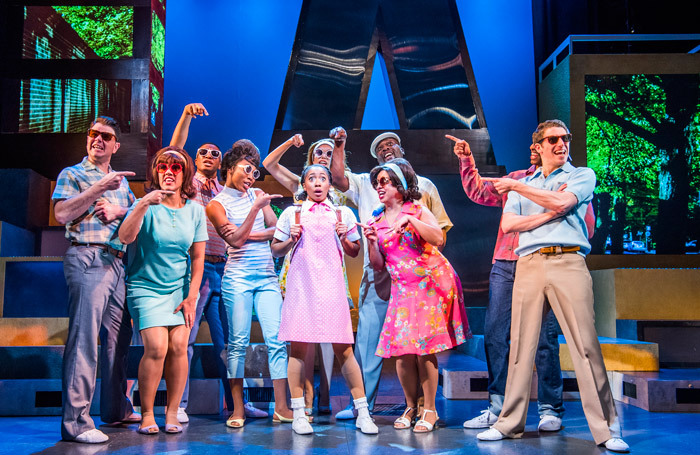 Charting a young black girl’s progress from childhood in 1963 Los Angeles, to her adult career as a Broadway performer in 1990s New York, the show duly ticks off multiple references and vibes. These range from Grease (high school romances) to Hair (hippy generation) and A Chorus Line (actors auditioning to be in a show). But what gives Kirsten Childs’ musical its own distinctive, confident and authentic flavour is the fact that it is partly autobiographical and ruthlessly honest in its portrayal of a black woman’s rites of passage towards personal acceptance. As a child, she prefers her white, blonde-haired doll over a black one, and at school behaves in such a “white” way that she is taunted and labelled “an Oreo”. The show, first seen Off-Broadway nearly 17 years ago, still resonates, though some of the musical theatre references may be a little lost in east London. I’m not sure what uninitiated audiences will make of hymns of praise to the great Gwen Verdon or Chita Rivera. These give the show a specificity, but also places it in its own rarefied bubble, one the title character travels within, both personally and professionally. There’s a curious sense of dislocation created by double casting the title role, with Karis Jack playing her vulnerable younger self, and Sophia Mackay taking over as her tougher, more mature self. Josette Bushell-Mingo’s production is more glossy than gritty, but it’s occasionally exhilarating and effectively propelled by video imagery that shows the changing times and cities.